Two Dudes Seafood Restaurant PV is a seafood restaurant that serves wild caught seafood that's Never frozen, Never farm-raised. Fried fish & cheese grits in a fried tortilla shell with our AB aoli and a choice of one side. A Southerner's Dream! All served with choice of one side! An 8oz. ground chuck patty topped with deep-fried fresh Gulf oysters & wasabi cream. Awesome! Check out "The Chalkboard" for our Daily Fresh Catches! Server was good- she pointed out specials on the blackboard and gave good recommendations on tacos. Our twice baked potatoes were overcooked. Shrimp special with datil bbq sauce were warm and shrimp were small. Tacos were good. Draft beer was cold but tasted flat. Coconut cake was good. First time at this location. 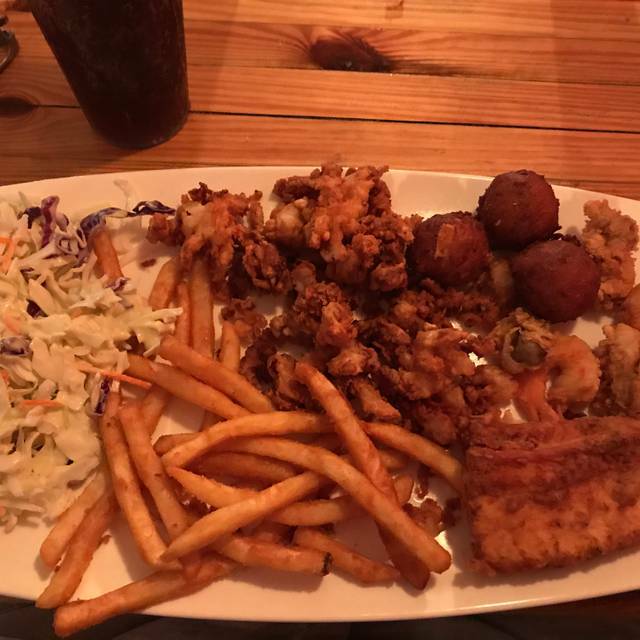 May give it another try since it is in the neighborhood but there are other good choices for seafood in the PVB area. Manager stopped by and ask about the meal - did not take the time to elaborate - did not want to complain as we are not regular customers. The Two Dudes is reliably good every time we go. The fish is fresh and prepared nicely. The sides are a little different if you want more than french fries. The service is good even when crowded. It is a good value for the price. It is not a white tablecloth restaurant but is not meant to be. Wasabi slaw was very spicy. I usually love it but was different this time. Wish the menu had collards and black eye peas or quinoa or sweet potatoes etc. Grouper was very good and service was great! Best place to get fresh board driven seafood menu in the area. Simple food prepared well. Anywhere you can get fresh local fish, fixed well, is my kind of place. Very sorry we ordered coconut cake. Instead of simple beautiful cake it was covered with sauces and whipped cream and very unappealing. The cake itself was good. Two Dudes is always fresh!! Its delicious! And you get so much food!! I highly recommend this place!!! Construction was going on and there was dust everywhere. Our waiter was great. Food was good. Excellent food, nice and friendly staff, however some slow service in some instances, but the friendliness and effort of the staff made up for the time. Two Dudes is always terrific! Great food and value. Great wine list also! Another great meal! Salmon was perfect. Awesomely fresh food. Portions were huge! My family split an appetizer (not necessary at all). We each got a fresh catch basket and split 2 deserts - the Strawberry Longboard and Chocolate Cake. First time to the restaurant but will certainly not be the last. Great place! Love Two Dudes. Fresh fish and the best choice in town. Kids meals free when dining with an adult! I love this place because we can talk - this is rare. Wait staff are great and well-trained and - so unusual any more - they are not constantly interrupting to ask how things are, how are things tasting etc. Thanks for that! When one walks into this restaurant, the atmosphere does not exactly say "fine food" but don't let the unpretentious decor fool you. Two Dudes serves an impressive array of delicious, fresh seafood. My wife had a salad with corvina. I had the crab cakes. Both were excellent. I then had to hurry home and immediately got sick. Our first visit was SO GOOD. Our second visit - not so much. Doubt we’ll go back. I have visited this two dudes location several times. The food is typically good but was not today. 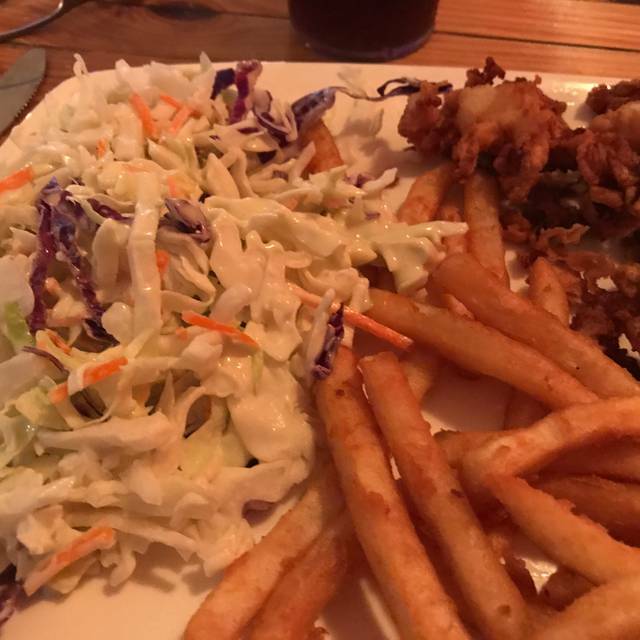 We started with the calamari which was really soggy and the “onion straws” were soggy onion pieces, not straws. Not at all like the calamari dish we have had here in the past. My husband had shrimp which he said tasted funny. He ended up feeling sick later that night. The restaurant really needs some music or something to liven it up. It fell flat on many levels. Not sure if we will return which is a shame since we live really close. 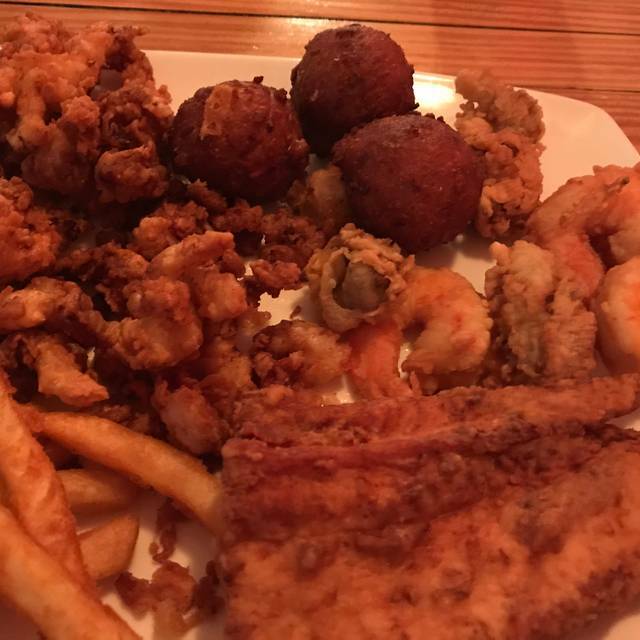 Excellent selection of seafood. Food and service was excellent. Although the restaurant was a bit slammed, service was excellent. They were running out of many of the fresh catch options but had what we wanted. Grilled preparation and sides were just right-Wasabi Mango slaw is pretty hot but delicious. The ambiance was pretty plain but comfortable. Had always heard great things about the Atlantic Beach location, but had never been. I didn’t know there was a location in Ponte Vedra until I discovered it recently on yelp. We were not disappointed at all and felt it lived up to their reputation. The food is the main event here, but the service was also excellent. The only reason I gave 4 stars rather than 5, is because it wasn’t exactly inexpensive relative to the setting. The food was definitely 5-star quality, but the ambiance doesn’t quite match up with the price point in my opinion. Still - very good and highly recommend. Good food and service. Prices too high for the ambiance and quality. Again - wonderful food - lovely service . . . two of the key things in a great restaurant! Great food and fun atmosphere. We will definitely return. What a pleasant dining experience. It was New Year’s Eve and we just wanted a meal. This place will become a FAVORITE. The food was outstanding our service was excellent - prices are so reasonable. Will definitely be returning! We were staying in jax beach for Christmas so went out for our final family dinner here! We should’ve eaten here every night. It was SO fresh, portions were huge (shareable! ), Laos back atmosphere and the service was friendly and attentive. The fish is supplied daily by a local vendor and the preparation is simple and delicious. Prices are extremely reasonable and our 2 youngsters enjoyed their meals as well. I sure hope Two Dudes is around for a very long time, we will be back!! Was a little surprised that the restaurant was not crowded but the holidays and time of day may have influenced that. Service was excellent and the food is always top notch. The portions of fish are larger than normal. This sounds funny but the cole slaw is to die for. Highly recommend. Decent local spot, interesting wine list and good service. Rustic setting but good value for money. A little bit in the shadow of its more illustrious neighbours but worth a try as an option. We had a very good dinner at Two Dudes in PVB. We had 4 dining that night. Three of us ordered the shrimp. One fried, one blackened and one grilled. All three were very good. The 4th ordered fish tacos and they were excellent. The only issue we had was with the fried corn side dish. It wasn’t very good. Prices were a bit high but that is expected for truly fresh seafood. We’ll be back. Perhaps Sunday evening isn't the best time to dine at Two Dudes ~ other days were better. Amazing selection of fresh fish. Perfect little seafood restaurant. I will return! Nice relaxing dinner on a Wed. night. Food was great...especially the Mahi Tacos. Prompt, attentive service and she was very patient with our group as we lingered way longer than we should have. Appreciate the low noise level so we could enjoy conversation. Perfect night...thanks! We have visited the Two Dudes Restaurant in the other Jacksonvillr location. MUCH better food. Never disappointed when we visit! Awesome, fresh seafood! Fresh fish and more at a casual spot at great prices. This was our second visit to this relatively new casual restaurant and it exceeded our first visit. Seafood is emphasized and noted that they have only fresh caught fish with nothing ever frozen. There are burgers, Mexican dishes, and other alternatives available as well. Daily specials and the menu are listed on a large chalkboard as well as in print. The atmosphere is casual and the service was superb. A special thanks to our waitress Savannah, who was knowledgeable, helpful, personable and caring. The prices are reasonable and 2 for 1 beers and wines make a happy Happy Hour. Don't miss it and you'll be back again.